View some of our recent design and branding projects! Click on Image for Map. Serving our Greater Plateau from the Tri-Cities in Washington State. To submit a request or get help with another printing venture, enter our online Customer Service Center. To download valuable programming and find accommodating data, look through our Resources and Support territory. To take in more about us, peruse through our Company Information segment. A simple to-utilize pull-down menu, web crawler, and connections to our contact shape show up on each page. Also, don't hesitate to counsel the site delineate whenever in case you're experiencing difficulty finding a specific thing. On the off chance that there's anything we can do to enhance our site, please let us know. Make the most of your visit! Phyllis and Plateau Press were great as I started my business. Phyllis and her team took the time to explain my options, let me handle stock, and helped me make decisions. The final results for my business cards, letterhead and envelopes were first rate and professional. I’d highly recommend them. Plateau press has been a great source for our printing needs and has provided excellent and efficient customer service! Click to Download PDF of press release - Plateau Press Emerges! Reaching for the next Plateau! Plateau Press -- claim to fame printing, hand craft and expert marking. Phyllis Shovelski drives our able and amicable print-shop on Clearwater in Kennewick. We are upbeat to celebrate more than ten years of able and die hard loyalty to organizations, families and events here on the great Columbia "PLATEAU". Plateau Press graphic design services are constantly accessible to help with your design needs. The vast majority of what we deliver is specially crafted for every client's needs and identity; no cutout planning here! And for your specially designed image, we have a full line of thousands of advertising and marketing promotional-specialty items in quality and quantity to match any budget. 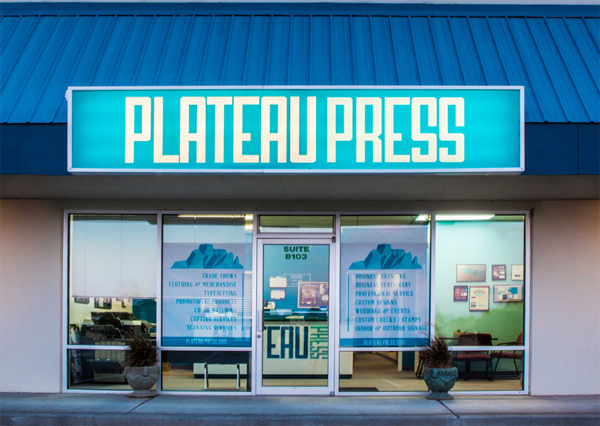 Plateau Press is located behind the O’Reilly Auto Parts on Clearwater; 7201 W Clearwater, B-103; 509.491.3801. info@plateau-press.com.